Next125 is the premium range of kitchens from Schuller – a renowned German kitchens brand. What makes Next125 in London unique is the option of quartz grey or lava black carcases, which can provide either an understated design or a glamourous look depending on which style you prefer. 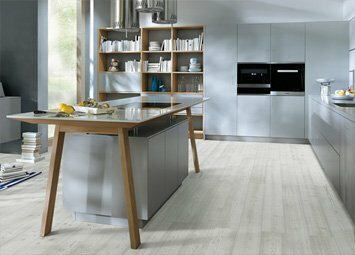 These two options from Next125 in London are available in two different heights and their comprehensive collection of door fronts range from laminate, high gloss lacquer, real wood veneers, glass (both matte and gloss) and brand new ceramic doors that give your kitchen the stylish finish you desire. Next 125 kitchens offer truly contemporary and innovative designs in their kitchen collection of which many of the details are unique and therefore not available with other kitchen suppliers. For example, look at the NX800 doors which have an integral flush handle available in crystal white or crystal grey. Or for something different look at their collection of sideboards available in 3 different heights and depths and in many different lacquereed colours and wood veneers. These will look fabulous in the large open plan living/cooking areas that are so popular today and can either match the kitchen furniture or compliment it by designing these in a different colour or finish. Also available is the next125 kitchen cooking island which works both as an island and also a central cooking hub and is much lighter in aesthetics than the more familiar solid island. 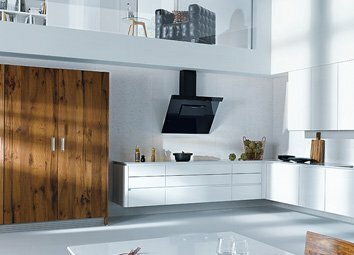 The beautiful and unusual wood veneered doors ( for example NX650 brushed smoked larch or NX620 brushed fir black) can warm up any kitchen layout either as a single colour or in partnership with a coloured lacquered door. The ceramic doors ( for example in ceramic concrete or ceramic marble) with either a stainless steel or onyx black edging will give any kitchen a truly wow factor. The pocket doors provide a sleek design when closed and yet when opened up allow any small table top gadgets to be accessible instantly with the provision of the electrical sockets fitted in the back wall of the unit. The slim 4mm thick glass side panels ( either mat of gloss) fitted to the exposed sides of glass fronted units give a refined and delicate detailing. Next125 is the premium range of products offered by Schuller Kitchens. With Next125 Kitchens in London, you can benefit from function and exceptional design, to help provide you with the lifestyle others can only dream of. With a number of innovative design features including the unique cooking tables, dynamic pocket doors and comprehensive collection of options including quartz grey and lava black carcases, Next125 Kitchens in London is the perfect choice for a statement kitchen in your home. View our portfolio to determine which style of Next125 Kitchens in London you prefer, and we will help to make your dream kitchen a reality, while ensuring the entire room is tailored to your needs. 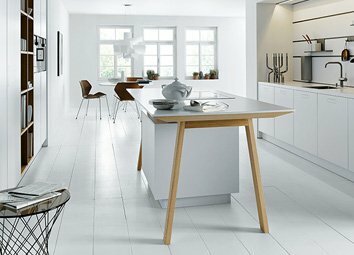 Schuller Kitchens are one of the most renowned German brands, and here at Lambert Welch Kitchens, we can provide you with their unmissable quality and style, at a competitive price. The designer kitchens offered by Schuller Kitchens in London can provide you with an understated, beautiful look, ergonomically designed to suit you – without the designer price tag. All of the Schuller Kitchens in London can be personalised to your tastes. We understand how important your kitchen is to you, and when we’re installing Schuller Kitchens in London, we will do so with the utmost care, integrity and professionalism, to ensure that the job is carried out to the highest of standards with every project.